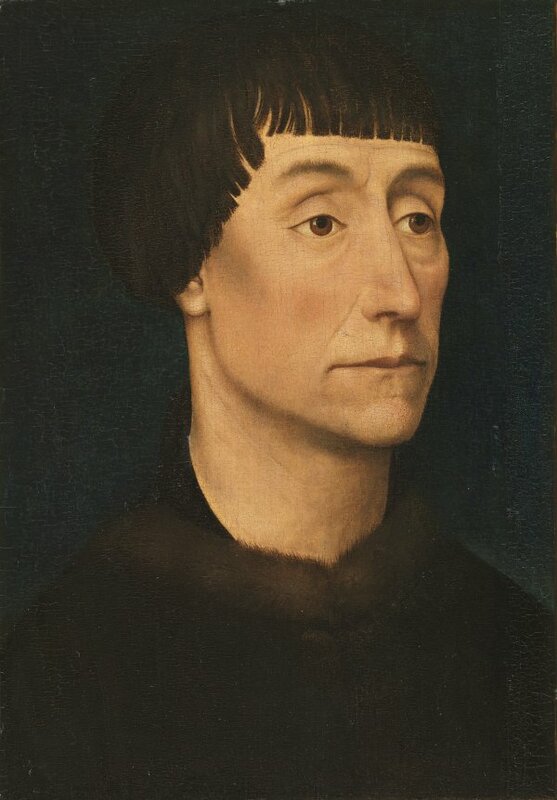 Attributed to Rogier van der Weyden, this work is a fine example of his activities as a portraitist, a genre on which he particularly focused in the last phase of his career. Such works reveal a number of shared features such as the plain backgrounds in a range of dark or light tones and the presentation of the sitters, generally shown bust-length. When the hands are included they are usually linked or holding an object. Van der Weyden’s portraits deploy a degree of idealisation that corresponds to his particular canon of beauty and which he harmoniously combines with a highly specific depiction of the sitter’s features. From 1898 onwards the present portrait was considered to be an autograph work until Colin Eisler modified this attribution on the basis of a technical study undertaken in 1979. Portraits constitute an important chapter within Rogier van der Weyden’s oeuvre, including images of donors in his religious compositions as well as independent heads and bust-length presentations. A significant number of these images can be related to the Burgundian court and are datable to the last phase of his career. One exception, however, is the remarkable Portrait of a Woman in the Berlin Gemäldegalerie, which is earlier. Individual portraits such as that of Francesco d’Este (The Metropolitan Museum of Art, New York) and Antoine, “Grand Bâtard” of Burgundy (Musées royaux des Beaux-Arts de Belgique, Brussels), or Portrait of a young Woman (National Gallery of Art, Washington), were all executed between 1455 and 1464, the year of the artist’s death. All these images conform to a single type, with a use of plain backgrounds, sometimes light in colour as in Francesco d’Este, or dark, as in the female portraits in Berlin and Washington. Individual sitters are usually depicted bust-length with the face in three-quarters. The forms of the face are precisely defined and their hands (if included) are shown as linked or holding an object. The artist makes use of a rigorous draughtsmanship that both conveys the appearance of the heads and simplifies their forms. These heads reveal a degree of idealisation that has been seen to conform to Van der Weyden’s particular canon of beauty but they also convey the individual features of the model in question. The present panel was considered an autograph work by Van der Weyden from the time it was first exhibited in an exhibition Berlin in 1898 when it was in the collection of Richard von Kaufmann. Panofsky commented that it was “one of his most revealing portraits” and that it “glows with a sublime humanity bordering on the saintly”. The current attribution, as a work attributed to Van der Weyden, is based on the recent study by Colin Eisler who made use of the technical examination of the painting carried out by Périer d’Ieteren in 1979 at the Institute royale du Patrimoine artistique. Eisler’s opinion was not, however, accepted by a number of other art historians who studied the work before and after the technical study was carried out. Wilhelm Stein suggested that the sitter is Pierre de Bauffremont on the basis of the similarity between the present sitter and a drawing of Bauffremont in the Recueil d’Arras.Nonetheless, most authors rejected this idea due to the physical differences between the two models, which are particularly evident in crucial elements such as the nose and mouth. In the late 19th century it was suggested that the sitter was Pieter Bladelin, but again this idea has not been accepted. The panel, which is cut down on all sides, has been restored on various occasions in the past. Areas of old repainting and additions that seriously affected the image were removed. The hardness of the features may be due to these earlier interventions, during which the panel itself was altered in size and work was carried out on various areas of the paint surface.